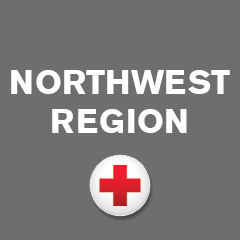 Entities, organizations and businesses throughout the northwest celebrated Red Cross Month — and the Red Cross wants to thank them. “We’re just really, really proud of our partners and what they do for us year-round, not only during Red Cross Month,” Red Cross CEO Alex Dieffenbach said. In Spokane, Mayor David Condon signed a proclamation declaring the celebratory month and encouraging citizens to participate. He’s announced the month for at least three years, according to board member of the Greater Inland Red Cross Leslie Czernik, partly because Condon is an honorary board member, and Megan Snow, Executive Director of the American Red Cross of the Greater Inland Northwest, let the city know it was Red Cross Month. “It helps raise visibility here in the city and strengthens our relationship with firefighters,” Czernik said, referring to the Red Cross volunteers who help fire victims. The iconic Steam Plant restaurant in Spokane also lit up its 225-foot twin stacks with bright red in honor of Red Cross Month. The Red Cross is one of the restaurant’s partners, and lights up its stacks to “celebrate or promote select philanthropic and cultural events in our community,” its website says. Moving west, Wenatchee celebrated once again with its banners hung throughout the town. It’s a tradition that started many years ago, recognizing March as “Red Cross Month” and calling attention to the volunteer-driven. Originally purchased through a grant written by former Chapter Executive Director, Marriah Thornock, the banners have been well cared for and re-hung every year since. Wenatchee City Engineer, Gary Owen, said in the article the banners help raise awareness about the organization and services available to the community. On to Seattle, where landmarks and corporate partners showed their Red Cross support by flying Red Cross flags — the Pemco and Amazon building, as well as the Two Union Square. The Red Cross thanks everyone for supporting and recognizing its efforts!